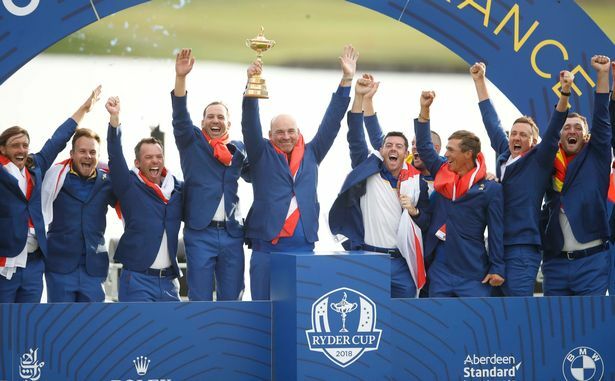 BBC Sports – Europe thrashed the United States 17½-10½ to regain the Ryder Cup – prompting wild celebrations, tears, and one player dressing as a pillar box at Le Golf National in France. Poulter – nicknamed ‘The Postman’ because he ‘always delivers a point’ – found a pillar-box fancy-dress outfit to the delight of the partisan crowd, then led the charge on to the 18th green when Noren holed a 35-foot putt to win the final match. That spirit has prevailed throughout the European team all week. They went in to the match as underdogs despite the US not having won in Europe since 1993. The American side boasted 31 major titles, and 11 of their players are in the world’s top 17. But Le Golf National is a different course to those the Americans are used to playing on – the tight fairways and deep, penal rough, a world away from the vast majority of PGA Tour courses. Only three of the American dozen had played a competitive round at the home of the French Open before this week, and it showed as the European players, who have played in excess of 200 rounds between them, looked more at ease. The Americans put their best players out at the top of Sunday’s singles order and the gamble appeared to be paying off for captain Jim Furyk with three wins and a halved match out of the first five. “We got some momentum but the Europeans responded well as they have all week,” said Furyk. Both the opening matches went down to the 18th, with Justin Thomas defeating McIlroy after an epic battle to put the American’s first point on the board before Brooks Koepka rolled in a three-footer to share his equally entertaining match with Paul Casey – the only one of the 28 matches to end all square. McIlroy was two ahead after four holes but Thomas hit back with birdies on the eighth and 10th. They were still level on the 18th but after Thomas boomed his drive down the middle, McIlroy pushed his tee shot into a bunker. His ball plugged and he was unable to get it out with his first attempt. His third shot careered into the water to effectively end the contest, with Thomas hitting his second to eight feet. The point meant the American, who was joint eighth at the French Open earlier in the summer, finished as his team’s top points scorer with four, from five matches. Fleetwood, who won four matches in partnership with Molinari on Friday and Saturday, also harboured hopes of becoming the first European to win all five matches at a single Ryder Cup but they were crushed by Tony Finau. None of the first 11 holes were halved but the American won eight of them to the Englishman’s three to go five ahead and he eventually won 6&4. Moments later, those around the 14th green were roaring again when Olesen completed an unlikely 5&4 victory over Jordan Spieth to put Europe 11½-9½ ahead. Olesen had not played since losing in the fourballs on Friday morning and his victory was built on four birdies on the front nine as he went five clear, while Spieth, who has been one of the US team’s star players with three points, never recovered from three successive bogeys. Poulter, unbeaten in five previous singles matches, then went two holes up on Johnson after the American dumped his second to the par-four 15th into the water. Up on the 16th, Rahm missed a short putt to allow Tiger Woods to get back within a hole but the Spaniard nailed his approach to the 17th to four feet and holed the putt to add another blue point. Rahm punched the air in delight, striding around the green in raucous celebration, before calming himself enough to console Woods, who had waited patiently to congratulate his conqueror. The defeat left Woods, who won his first tournament in five years at the Tour Championship last week, with zero points from his four matches. Bryson DeChambeau and Mickelson also ended with zero points, while all the Europeans contributed. Johnson won the 16th to stay in touch with Poulter but the thousands gathered round the 17th green were expecting to celebrate another European point minutes later. Poulter, for once, failed to deliver, missing a six-footer to win the match. However, he strode to the final tee, smashed his drive down the middle and flicked a mid-iron to six feet, a putt conceded by Johnson, to put Europe 13½-9½ ahead and just one point from regaining the trophy. Any one of Molinari, Garcia, or Stenson could have secured the winning point – and it was the Italian who did so. The winning moment came when Mickelson, three down with three to play, hit his tee shot on the par-three 16th into the water and conceded the hole and match.